The house foundation is the basic structure that supports the weight of the house and provides the above-ground, level platform for construction. Lying below ground level of both types are concrete footings which transfer the weight of the house to the ground. Footings are discussed in another chapter on this site, but they are in reality a part of the foundation. 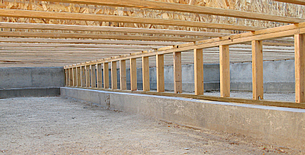 The typical crawlspace foundation consists of the footings, a concrete block perimeter which supports the exterior walls of the house, and concrete block columns which support the wooden floor joists. The block columns have concrete footings underneath, as do the walls. 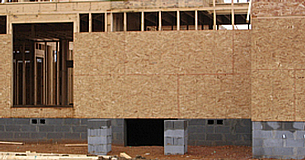 All of these should be indicated on your foundation plan. Your masonry contractor will know how to include all of these in his work.